PE/PP 25 MICRON FILTER BAG, China PE/PP 25 MICRON FILTER BAG, Quality PE/PP 25 MICRON FILTER BAG manufacture by COX Filter Cloth. 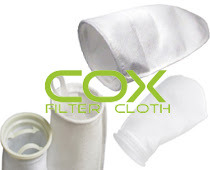 COX FILTER CLOTH Weave type Liquid PP filter bag available from 50 micron to 500 micron. Plastic, carbon steel, stainless steel, belt neck material can select. liquid filter bags for all types of liquid filtration systems. Micron rating from 0.2 to 200 microns to suit for your application. Standard felt filter bag materials include PP,PE,nylon,nomex,PPS,PTFE,or micron -fiber material. Mesh filter bag,the material include nylon-monofilament,polyester monofilament or polyester multifilament material. Customer configurations,packing and labeling available on request. Stainless steel ring,nylon ring and PP RING are select.